… of the current re-write written. … I’d be finished my “first draft” in 100 days. That wouldn’t be too shabby. Especially since a large chunk of what I have actually counts as a re-write, so I’m a step or two closer to finished than first draft, really. That would be cool. Shame it doesn’t work that way. And, that’s all I have to say on that. So, for a little comic relief, let’s study the changing Give Way rules (yes, here in NZ we have observed right-hand turners go before left-hand turners forever – and we’re a left hand side of the road country … so do whatever you’ve got to do to realize that we’ve been doing it different to pretty much everyone). I rather enjoyed this: WEST AUCKLAND GIVE WAY RULES FROM THIS WEEKEND, including rules such as “Holden will never give way to Ford, and vice versa, leading to collisions whenever they meet.” and “Ford Capri claims classic status but Holden Ute gains right of way because the Capri has been painted pink….and it’s a Ford.” – but it’s the pictures that really make it, so go check it out. In this case, it’s a distraction. I just have such a soft spot for a waltz (something I have only recognized in the last few years … I suddenly realized that so many of my favourite tunes happen to be waltzes). This one makes me want to sway and jump along with it. Shame about the sprained ankle & foot at the moment … lucky they’re both on the same side. I still have one foot to tap. I was going to say how much I love being a part of The Countdown crew because it exposes me to music from all over … but, I see this song is from the UK, so nothing special popular-music-wise (UK/USA/Australia are all well represented on NZ radio and TV) … ah well, maybe in a day or two I’ll pick a stand out from somewhere particularly interesting. You can read the first few chapters here, but if you wish to read further, I would encourage you to sign up for a free writing.com account which will allow you to read, and give feedback on, many great (and less than great – but how are we gonna learn if you don’t tell us?) written works. I’m trying to research some history in order to write a decent short story for a “competition” (although, I’ve decided I don’t care if I win – I’m leaving it too late to do my best – but I must make an effort to enter). 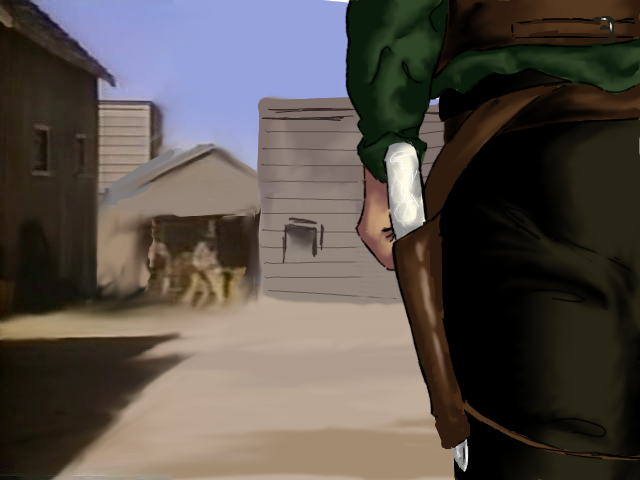 I had this plan to do an Alternative History/Steampunk story, and thought it would be really fun to apply Steampunk to something other than Victorian England or the Wild West. How well I’ll do, I really don’t know. I’m planning to have a go at the alt. history, anyway. The original prompt I started working on this story for (the new goal doesn’t have a theme or prompt – it’s Open) included dragons, so that had me thinking China. So, after a little research, I discovered the story of Li Zicheng – quite interesting, by all accounts. And, if you have the time, this video probably has the best information about his time in “power” (however you define it). I’m quite keen to watch the next part, now. Perhaps tomorrow. 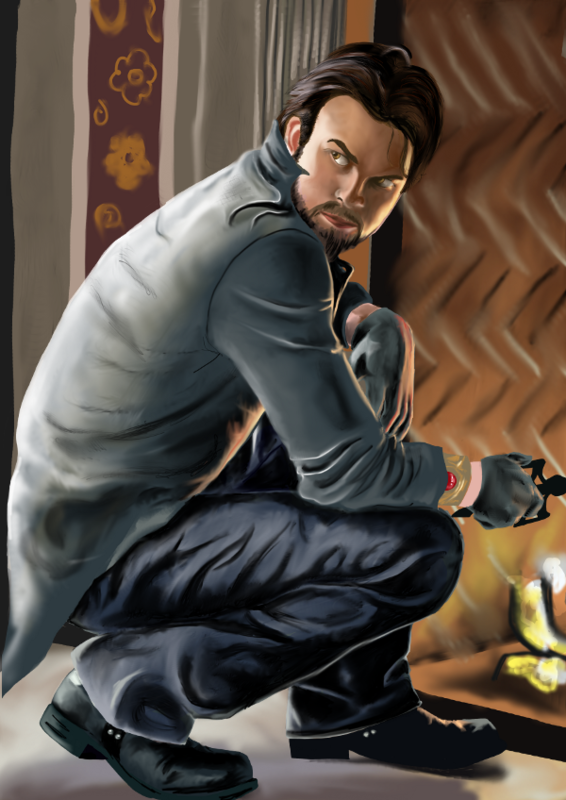 The completed drawing of Braph kneeling in front of a fireplace. Managed something along the lines of 2,400 words today – I’m not entirely sure because I closed my session of Scrivener (after giving myself a MASSIVE fright when I renamed my story’s folder while Scrivener was open (duh! – rookie mistake) … oh boy, is it scary watching your files go blank? Yes, yes it is … luckily, I just had to open the file from the newly named folder and all was well). How did I manage this (the 2,400 words)? It’s Saturday here in beautiful Aotearoa/New Zealand and my husband managed to have enough spare time to take our son to the supermarket and then to a friend’s house with him, giving me a decent few hours alone with my WIP. I probably could have written more, but I get distracted now and then, and got a wee bit held up after a review. A fellow writer was reading my chapters to date (well, up until a few days ago) for me, as I wanted to know how things felt to someone less close to the project. In particular, I know I want a romance to develop between my leads (oh, come on, it’s what people like to read), but I want that development to feel natural, which can be tricky when I’ve had these people at various stages of togetherness and apartness (sure, it’s a word) over the last few years. Anyway, my reviewer gave me some brief feedback on my first chapter, and they made comments in particular on my writing style. Now, because writing style is really quite fundamental to writing, this gave me a big pause. I mean, how do you just keep going, knowing you’re gonna have to come back and pretty much re-write just to fix your basic voice? So, I’ve been quiet on here, again. Well, I have been writing my story, and planning my short story due in two weeks (eep! ), and reviewing other people’s stories (first/revised drafts, and they have reviewed mine in kind, and wow, it’s been good) … Oh, and all the while I’ve been working, and entertaining, feeding, changing, blah blah, my toddler … and whatever else I do all day … What do I do all day? Honestly, half the time I forget. Right, back to it.